In November 2014, as part of the protests against the privatisation of water in Ireland, an impromptu sit-down protest stopped the car of a minister and her entourage. Now, those protesters are charged with kidnapping, a charge that could result in prison sentences and removal from political office. At our last branch meeting we agreed to support the international campaign, #jobstownnotguilty and passed this resolution. It is vital that the Labour and Trade Union movement internationally respond to these aggressive acts by the state. This particular case is an example of the Irish State attempting to criminalise protest. This is not limited to Ireland but has implications across Europe where many people have protested against austerity over the last few years. The response of many governments has been to not been to change course but instead attempt to hold back these movements with the introduction of laws to limit democratic rights to protest. That is why it is so important to support our brothers and sisters in other countries when their rights are attacked. It is not simply, in this case, a matter for the Irish but an issue of international solidarity. They are fighting the injustices of a system that does not recognise international borders when it comes to exploiting labour and repressing their rights and nor should we when fighting back! The real reason behind the Irish state's offensive was the fact that this protest was part of an organised movement to defeat one of the governments most hated measures of austerity - water charges. The 500 protesters who gathered around the Deputy Prime Ministers car in November 2014 were peacefully protesting against this grossly unfair tax. The idea of taxing people for their water in the Emerald Isle was beyond a joke and a mass protest movement eventually defeated the idea. This is why the Irish establishment wants to criminalise those who took part. It is a move born partly out of spite but it is also meant to serve as a warning for those who intend on protesting in the future. The 19 defendants who will go on trial in April will attempt to demonstrate that it is not they who should be in the dock but rather the state itself. A state that attempted to make ordinary working people in Ireland pay for a crisis which was not of their making. If the protestors win, this would represent a huge victory for Anti-Austerity protestors not just in Ireland but throughout Europe and beyond. It could also open the flood gates for further mass protest. If the defendants lose and political representatives such as the socialist TD Paul Murphy (one of the 19 defendants) are imprisoned this could also provoke a huge wave of protest. If Paul Murphy is imprisoned for more than 6 months he will automatically forfeit his seat in parliament. The political stakes are very high and the State faces significant embarrassment if it loses but the stakes are also high for all those protesting against austerity and who defend the right to protest. A victory for the Irish State will be a shot in the arm for other governments looking to use and extend their armoury of repressive laws to criminalise protest. If a peaceful sit down protest is 'unlaeful imprisonment, what is a picket? This is why we cannot let our Irish brothers and sisters fight this alone. 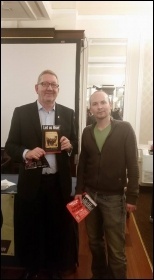 Unite General Secretary, Len Mcluskey made clear his support in a letter co-written with Jimmy Kelly, the secretary of the Irish Region (Unite organises on both sides of the Irish border) addressed to the Irish minister for justice, Frances Fitzgerald. "Sit-down protests that delay politicians are a part of the fabric of democratic rights that people have won over many years. It is a very serious infringement of the right to protest that the Irish state and judicial system are pursuing these cases, criminalising protest and working class communities. "It is outrageous that people could face long prison sentences and that a democratically elected parliamentarian - Paul Murphy TD – could be removed from parliament. 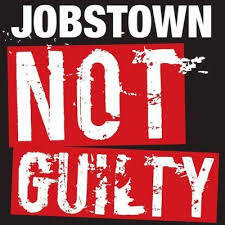 "We demand that the charges against the 18 are dropped immediately, failing which we will build support for the Jobstown defendants and for the right to protest among the millions of trade unionists in Britain and Ireland." The campaign is supported by well known figures internationally including: Noam Chomsky, Jean-Luc Mélenchon - French presidential candidate of the left, Yanis Varoufakis - former Greek finance minister, Angela Davis - US civil rights campaigner, Sean Hoyle - president of transport union RMT, Chris Baugh - assistant general secretary of civil servants' union PCS and many others.